Talk about good. Just put these few ingredients together and you have a good meal. 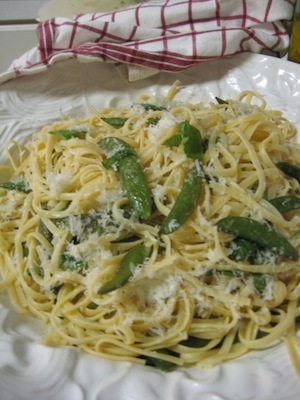 Think fresh sugar snaps and basil from the garden, linguine from the pantry, and Parmesano Reggiano from the refrigerator. It just cannot be beat. In fact, my mouth is watering just thinking about the olive oil and butter that browned as I sautéed the sweet sugar snaps and added all that golden goodness to the pasta. In a skillet over medium high heat, add the butter and olive oil. When it starts to sizzle, add the red pepper flakes and the sugar snap peas. Sauté the peas for about 4-5 minutes or until crisp tender. Salt to taste. Add the pasta to a large bowl, and then add the sugar snap peas along with the olive oil and butter from the skillet. Mix well, add cheese and basil, and serve immediately. If you like garlic and you would like to add it to this dish, just add it to the butter and olive oil at the same time that you add the red pepper flakes. Just make sure that you keep stirring so that the garlic does not burn. Serves 6.